Hello, my dear readers, it's a beautiful Monday morning here and I want to encourage you to start your week out being refreshed in His Word, strengthened in His power and encouraged by His spirit. Know that all you do as a wife and mother is a ministry to the Lord. The cup that you fill, the meal that you make, the socks that you fold and the clothes that you mend. Every single and last bit of it is your kingdom work for Him and counts tremendously. Mothers, ask the Lord for wisdom this week as you embark on it. Take each minute to truly relish every moment and try not to hurry through your day to cross off your self-made to do list. Don't be angry because your home is messy or cluttered but know that your family lives there and be thankful for that. Thank Him for everything because without Him you would not be alive. Slow down and enjoy the many rich blessings the Lord has bestowed upon you and you will have a blessed day! -Thanks for visiting A Wise Woman Builds Her Home! Are you encouraged by what read here? Now you can get free updates sent to your email by subscribing and never miss a post. Thank you. I really needed to hear this today. When no one appreciates or recognizes our efforts it's nice to know that God does. Bless you. Thank you for this sweet encouragement today - just what I needed to focus my week in the right direction. Ah, I'm refreshed. Thank you for the warm blanket of encouragement. Thank you so much! I am posting my blog on prayer this morning. Thank you, June! I enjoyed this! Never give up, stay strong!! 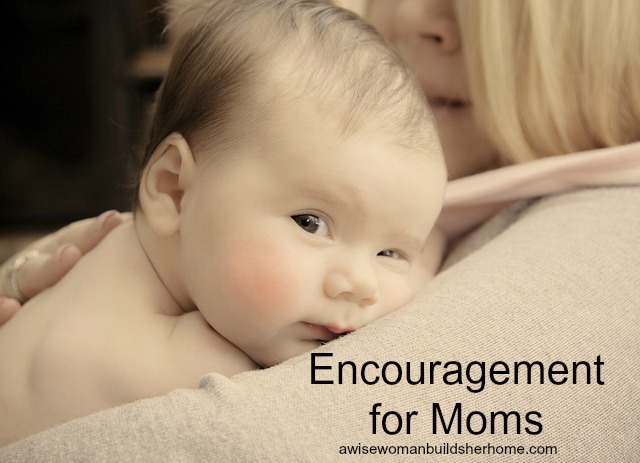 Great words of encouragement for this mama. All of those quotes were inspiring, but one really made me think: An ounce of mother is worth a pound of clergy! Never heard that one before but it's worth thinking upon! Beautiful and thank you so much. The last paragraph especially meant so much to me! Thnaks for the encouragement. I love that quote by Abe Lincoln. Thanks for the lovely opening to the week after a particularly difficult Monday morning with one of my little guys. It did remind me why I miss my own mother so desperately sometimes too. How beautiful and encouraging! Everyday is Mother's Day! Bless you for your precious ministry.